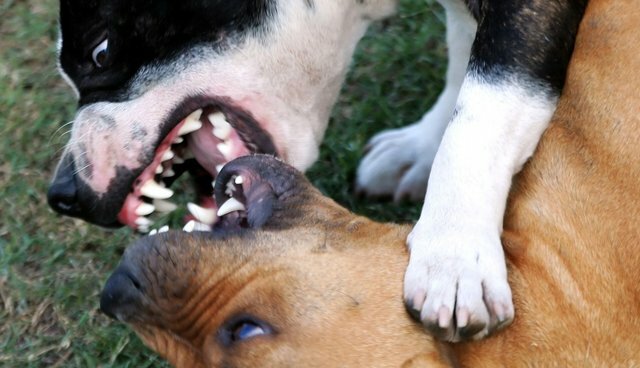 A new report into dog-fighting -'Betrayal of Trust: The Tragedy of Dog Fighting' - reveals at least one dog fight is likely to take place every day of the year somewhere in the UK despite the barbaric 'sport' having been outlawed almost 200 years ago. The authors of the report, criminologists Dr Simon Harding and Dr Angus Nurse spoke to a large range of people including those involved in dog fighting, and examined the practices, motivations and extent of dog fighting as well as the means to tackle it. Tom Quinn, Campaigns Director for League Against Cruel Sports said: "The UK's dog lovers will be sickened to learn that the cruelty of dogfighting, which can result in torn flesh, blood loss, disembowelment or even death, continues to go on in this country. "Traditionally dog fighting was hidden away in rural areas and managed almost to a professional level. Now we're seeing a move to urban areas, where dog fighting is becoming a way of establishing dominance, often related to gang activity. Either way, it's often about machismo and money, and the dogs will inevitably suffer." Dr Simon Harding, author of the report, and Senior Lecturer in Criminology in Middlesex University's School of Law said: "From our interviews with people who involve their dogs in fighting, and analysing data from a wide range of sources, we found clear evidence of dog fighting in the UK ranging from the every-day impromptu street fights or 'rolls', through hobbyists to professional fights where huge amounts of money changes hand. 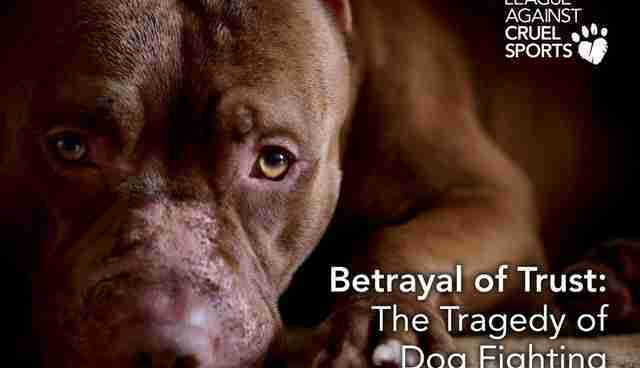 "It is clear that regardless of the level of dog fighting, these people are all connected by a common thread of secrecy, callousness and links to other crimes." Dr Harding continued: "Dog fighting is a cruel and violent practice which has no place in 21st century Britain. Offenders take ordinary animals, manipulate and exploit them for profit and reputational gain. It is a serious concern that this activity, outlawed 180 years ago, remains, and in some communities, thrives even today. We should all work together to eradicate this practice once and for all". The suffering of the dogs involved not only includes the pain – and sometimes death – inflicted during the fights themselves, but also from brutal training methods, particularly at the Professional level. Dogs reared for fighting are engineered so they are robbed entirely of their natural social behaviour and designed to fight regardless of pain or risk. Tom Quinn adds: "As a visit to the vet would lead to awkward questions, fighting dogs are often denied proper medical attention and horrific injuries are left to be patched up with superglue or staples, often with fatal consequences." From analysing data provided by the Metropolitan Police and other sources, the report identified that young men who owned 'dangerous dogs' or 'status dogs', as defined under the Dangerous Dogs Act, were widely associated with or involved in an extensive range of criminal activity, including Robbery, threats to kill, Actual Bodily Harm and Drug Possession. In Merseyside, 23 out of 25 dangerous dog owners had 87 convictions amongst them, while in the West Midlands 79 out of the 126 'dangerous dog' owners had other criminal convictions. The specific offence of dog fighting does not exist in the UK; it is contained within the broader offence of animal fighting prohibited under Section 8 of the Animal Welfare Act with a maximum penalty of 51 weeks in prison. By contrast, in the US dog fighting is a felony offence in all 50 states with a maximum penalty of several years in prison. But because of the clandestine nature of the activity, it is very difficult to obtain convictions. Tom Quinn added: "Disappointingly low conviction rates highlight the difficulties of enforcing the law when it comes to such a clandestine activity and we believe more resources and research into the problem is essential. In addition, we are recommending measures that could help make the law on dog-fighting more enforceable, including the mandatory recording of dog fighting offences and strengthening penalties to bring them into line with other European countries". The League is asking UK residents to make a difference by contacting the Home Secretary Theresa May asking her to take action on dog fighting.